Applique is a technique that uses different stitches to “apply” one piece of fabric to another. With cosplay, it’s a great way to add fiddly details to a costume without using paint or embroidery. 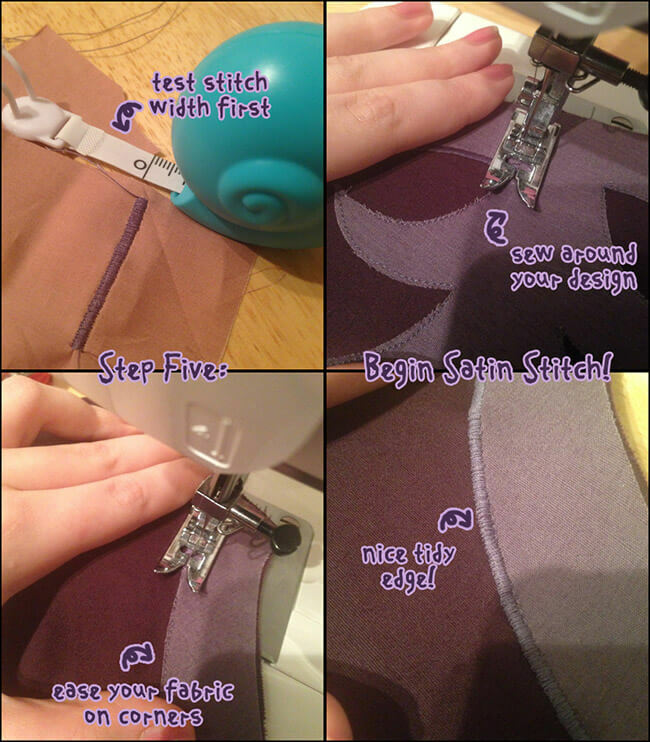 For this guide I will be using satin stitch, a close stitch around the edge of a design. In basic terms, it’s a close zigzag in a thin width that finishes the edge. Most sewing machines have a zigzag stitch you can adjust so it’s very accessible too – no fancy features or modes here! You can use it on any size design, on basic shapes or on complex patterns – the only limit is your imagination! All three costumes shown above have had applique used for contrast detail, all in varying shapes and sizes! 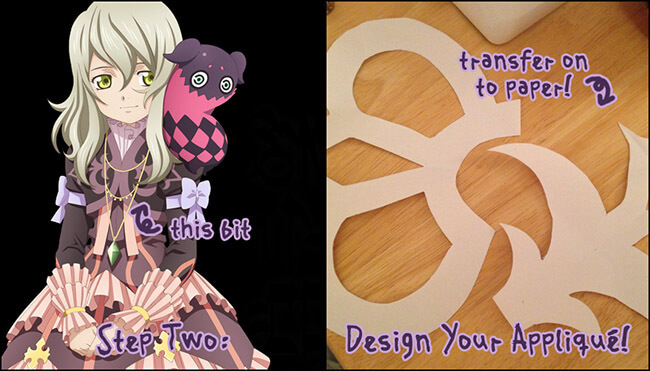 And as you can see Tales of costumes have a lot of trims and details so for this guide I will be using my Elize jacket from Tales of Xillia. The design has a complex front and back, finished with a trim around the edge. Fun times with the sewing machine ahead! Pattern your garment and cut it out. 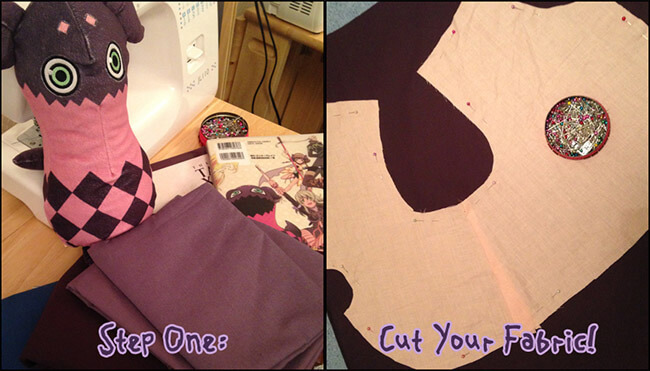 Depending on wherever your applique is going (front, back, sleeves, etc), cut a copy in your contrast fabric. This will help the applique fit more accurately. If your applique is small, you might not need a full copy, but it can help you make sure it fits properly! For this costume the trim follows all the way around the jacket, so I cut an exact copy of the front and back. I also cut a copy for the lining. Pattern your applique design. Make it roughly the size you want it to be – but keep in mind once sewn it might grow around the edge by 1-2mm. My shapes are symmetrical so I made patterns from folded paper first. There are designs on the front and back, so they were made and cut separately. IRON YOUR FABRIC. Make sure your fabric is clean and ironed before you do anything else! You’ll need your contrast fabric for this part. Creases or folds will affect how the applique sits. Once ironed, iron your bondaweb where you will need it on the fabric. For this jacket, the front and back panels was needed and around the bottom edge, so I added bondaweb in parts to reduce waste. Once your bondaweb is ironed on, transfer your design onto your bondaweb! The great thing about bondaweb is that you can draw on the removable side before you cut it out! 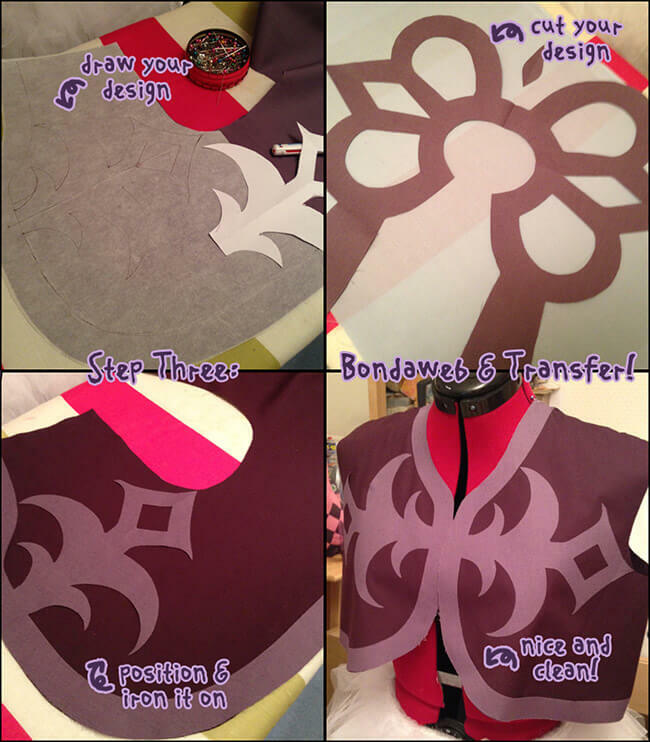 Cut out your design and apply the bondaweb pattern to your garment. Remove the backing slowly, make sure it is smooth and iron it on! Sew around the edge with a straight stitch. Bondaweb is great stuff, but it’s not always super secure, so sew it down first! I use a 2mm stitch to sew around the edge because it makes it easier to maneuver the fabric. But you can use a longer stitch if you want to. Don’t worry about it being totally neat – your applique will cover this stitch. Depending on your design, you can either use an identical colour thread for a subtle edge or a contrast thread to make the trim stand out. Make sure you have LOTS of thread – Elize’s design used over 300m of thread (3 100m spools of Gutermann)! I would also recommend using the same thread for the top and bottom stitches – this makes the colour more solid around the edge. Once sewn, IRON YOUR FABRIC. Now the contrast fabric is glued and sewn down, iron it and make sure it is all smooth. Any creases/wrinkles at this stage can be disguised a little by the applique to come! Time to start your applique! Satin stitch the edges! This can take 5 minutes or 5 hours depending on your design. 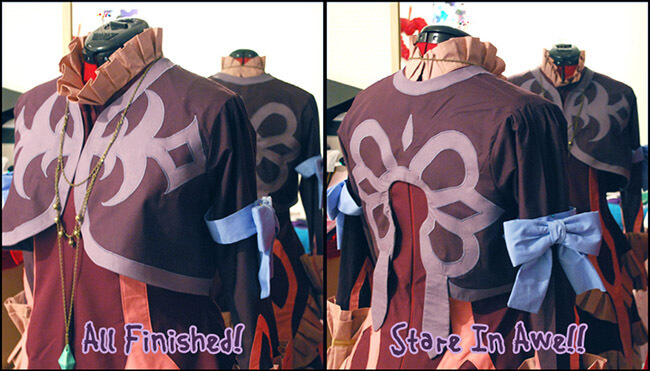 Elize’s jacket took me around 3 hours to complete. When sewing Elize I used a 3mm zigzag width and 0.1mm length. You can use a thinner or thicker stitch if you want, but I find 3mm usually looks tidy and covers all stitching/edges underneath comfortably! ALWAYS test your stitch first, and make sure your machine can still feed the fabric when sewing rather than jamming – if the stitch length is too short sometimes it can chew the fabric or thread underneath. Make sure you take it SLOWLY and are precise with your sewing – it is a lot to unpick and redo and might damage your fabric if you make mistakes. 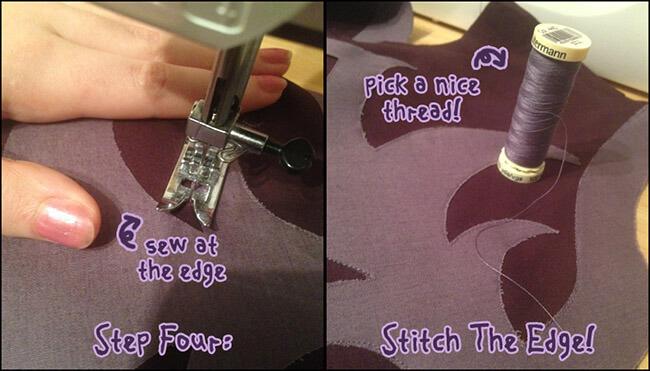 Start from the “bottom” or “inside” edge when sewing – it makes any visible starting points much less distracting. When sewing corners, lift the foot and position the needle manually. This way it won’t look jaggy and misaligned. Take your time and move the needle back and forth if needed. Also, if your design is symmetrical, try and mirror your sewing to give it a cleaner finish. When sewing curves, turn the fabric gradually and lightly pull it as it turns. The foot might not always sit straight but it will make the curve smoother when sewing. It’s worth practicing curves on a separate piece of fabric if you’re new to applique – it’s tricky and practice definitely helps! IRON YOUR FABRIC. Your design will look really wiggly and ugly right now. 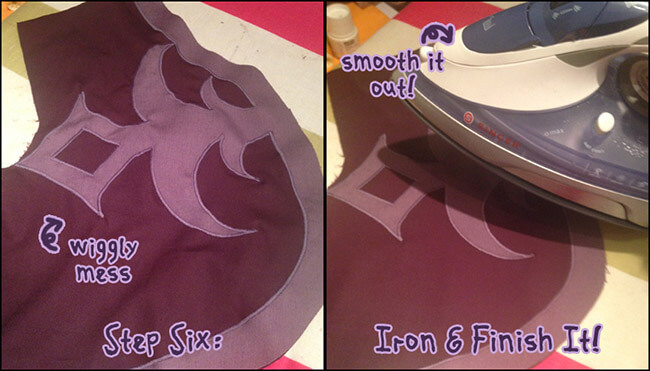 Iron it carefully and smooth out any wrinkles or wiggles and it will look MUCH better! If you added some interfacing for stability, you can remove it now. Admire your work! Applique is time consuming and tiring but YOU DID IT!! All that effort really shows. Practice makes perfect!